The mountain with a horse for a head sighed, "I'll never forget this snowy day." And then it got hit by a flying truck, right in the umbrella. Ladies and gentlemen, I give you Mountain. Any given sentence from a Mountain "play" session can look like a complete load of gibberish, but it's actually a very simple game. For $1, you get a sort of toy/virtual pet hybrid that's meant to be running while you're doing other things like working or Facebooking or, if you're playing on iOS, commuting. Heck, I've even run it while playing other games. You can spin it around, observe it, zoom in and out, and play little melodies at it because why not? That's it. The game requires very little of you. Basically nothing. It's a talking mountain that hovers all alone, in the vacuum of space, occasionally spouting heartfelt observations and bizarre pieces of wisdom. Time passes, seasons change, trees grow and wither and die. Occasionally very odd objects—like the aforementioned horse, truck, and umbrella—come careening out of the heavens and embed themselves in your mountain with a damn near nuclear crash. But, you know, your virtual pal is a mountain. It doesn't seem to care so much about the ants (and umbrellas and trash cans and giant CDs and bowling pins and gramophones) that end up on its back. And the best part? It's all random. Everybody's Mountain experience is different. Having Mountain open on my desktop for the past couple days has really, honestly surprised me. Truth be told, I liked the concept when I first found out about it, but the way it's snapped into my day-to-day life, almost puzzle-piece-like, has really made me wish there were more games like this. I'd love to see an entire genre of low-impact interactive toys that just kind of... make people happy. Or sad. Or make them think about things they normally shove to some dingy, maggot-infested corner in the back of their mind. "I feel lumpy," my mountain said as chill winds whispered through an in-game fall night. And then, because I couldn't help it, we watched Adventure Time together. I kept Mountain open on my desktop throughout, because why not? Shortly after an entire horse crashed into the peak of my mountain, I noticed that when it snows the horse also becomes snow-capped. With Mountain, it's the little things. "I am made invincible by this beautiful day," my mountain said one morning as I clambered over to my work PC at Way Too Early O' Clock, eyes full of sand and breath reeking of rot. I still felt like garbage (I am not a morning person), but I still thought to myself, "You know what? Maybe it's not such a terrible day after all." I was feeling super lonely after an all-day work binge left me imprisoned in my home/office until 4 AM, but then a giant heart crashed into my mountain, leaving a cloudburst of smaller hearts instead of dirt or dust. I heart you too, Mountain. "Oh the air is singing and the leaves smell beautiful," my mountain said as the in-game weather matched the real-life weather outside to a tee. THIS GAME IS WATCHING ME, I wanted to shout. "I am full of rocks and dirt and love," it said randomly while I was writing this article. I don't know why that particular line made me smile so much, but it really brightened up my day. "Is there another like me?" asked my mountain into a void of black nothingness. I tried to respond to it by pecking out little melodies using the keys on my keyboard, but it didn't respond. "Can it even hear me?" I wondered. "Does it know there's somebody watching it at all?" 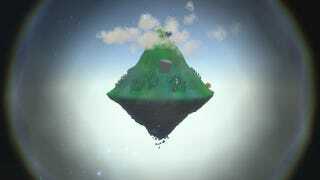 "I cannot tell if my life is going in circles or if I'm making any progress," my mountain lamented as the game's camera made it appear that the mountain was literally spinning in a slow circle. "Me neither," I replied aloud. "Me neither." I glanced over at my mountain while working with only the dull glow of my monitor to keep my work room lit. In the game it was a near pitch-black winter night. I noticed that trees on my mountain were dying, and very little was rising up to take their place. "Is it... aging?" I wondered to myself. And then I realized it might die alone. Rock Paper Shotgun also put together an excellent feature (that I was slightly part of) discussing multiple people's experiences with Mountain over the course of many days. Definitely peruse it if you get the chance. It's also worth noting that Mountain comes from David OReilly, the same guy who made the fake games in very good sci-fi romance drama Her. There's actually a strong parallel here, when you think about it. Mountain is a game about gradually allowing yourself to be affected—sometimes even emotionally—by a computer program, to the point where it becomes weirdly integral to your day to day life. That was kinda the whole premise of Her, too. So there you go. Mountain will cost you a single dollar, and though it's not perfect by any stretch, it's extremely unique and has a certain, extremely strange magic about it. Game, toy, thing—I don't care what you call it. It's neat and clearly heartfelt. Check it out.